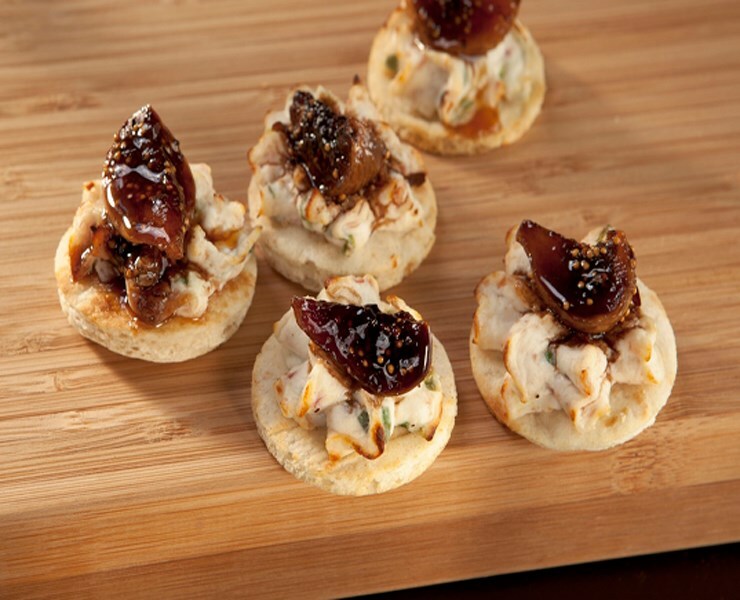 A plump handcut Calimyrna Fig, marinated in aged Balsamic Vinegar, paired with a creamy savory rosette of goat cheese, fresh chives, and applewood smoked bacon, all placed on a hand cut flatbread. A mediterranean inspired hors d'oeuvre / appetizer, creating an irresistible sweet and savory flavor profile, Kabobs' Balsamic Fig & Goat Cheese Flatbread provides elegance to a tapas function or an accent to a small dinner salad. Our team of chefs hand select only the plumpest Calimyrna Figs, then marinates them in aged Balsamic Vinegar. To accent these sweet notes, our culinary team adds a creamy rosette of goat cheese, fresh chives, and applewood smoked bacon. This colorful marriage of sweet and savory is perfect as is, and pairs nicely with your favorite table wine.